An Exact Representation of the Death of Captn. James Cook, F.R.S. at Karakakooa Bay, in Owhyhee, on Feby. 14, 1779. Accurately Engraved from a Drawing made on the spot purposely for this Work by A. Hogg. Beginning in 1768, Captain James Cook undertook three historic voyages of exploration around the world. 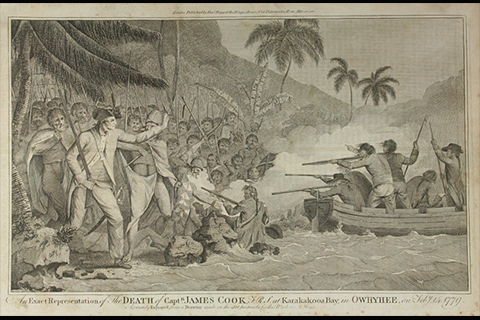 While Cook was not the first European to investigate many of the locations he visited, the large body of artistic output produced during his voyages played a significant role in shaping a Western vision of native peoples from faraway places like the South Pacific. On each of the voyages, artists created sketches, drawings, and occasionally paintings based on their first-hand observations that were widely reproduced in travel accounts well into the nineteenth century. Sydney Parkinson and Alexander Buchan on the first voyage, William Hodges on the second, and John Webber and William Webb Ellis on the third came from diverse backgrounds and brought with them differing artistic skills and training. After returning to England, their work was reproduced in engravings, usually reinterpreted through a neoclassical European eye, to illustrate the official published accounts of the voyages. 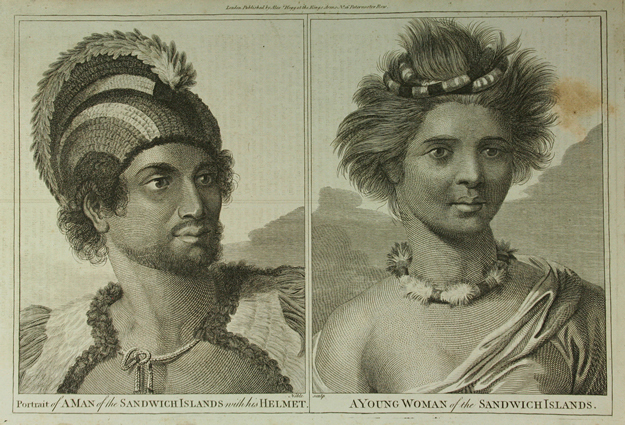 The popularity of these accounts resulted in many other similar publications in which engravings were copied, frequently with less attention to detail and artistic skill, to feed the interest of a European audience fascinated by the allure of the peoples, places, and material culture encountered in exotic, foreign lands.